” Cisco to Pass the Baton from John Chambers to Chuck Robbins on July 26, 2015 ” – May 12, 2015. Chuck Robbins, CEO designate of Cisco. Chuck Robbins, the present Senior VP of Operations, Cisco, will succeed John Chambers as CEO of Cisco from July 26, 2015. 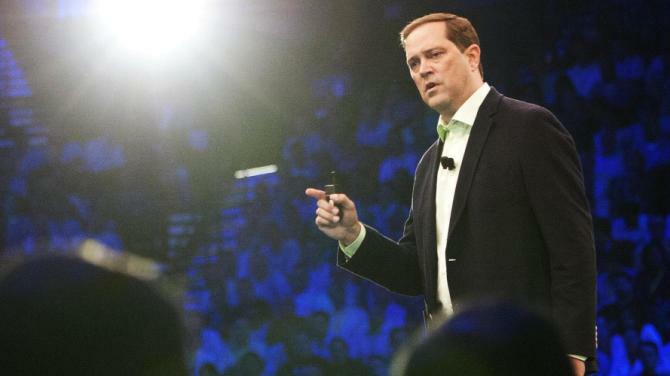 Chuck Robbins will take the reins at a time of captivating, charming, and controlling period for technology as a field as well as technology as a changing element in Cisco. From Cisco, the routing specialist, to Cisco, the dominant networking giant, has been the ‘signature accomplishment’ of John Chambers during his remarkable 20 years period as CEO. Veritable transition from a purely hardware business to a highly profitable union between software & hardware ( just as the analog and digital computers of the 1980s ) will probably be the perceptible ‘ shift ‘ that will mark Chuck Robbin’s task. There are challenges – technological & organizational – for every big organization when leadership changes take effect. 1. Organizationally speaking : For Cisco, this is a seamless transition marking the leadership change with ‘ continuity ‘ as the mantra. Both John Chambers and Chuck Robbins have sales background and Chuck Robbins has been a close adviser to John Chambers. Chuck Robbins knows the business and culture of Cisco well. ‘ Breaking-in ‘ period will not be needed. He enjoys immense credibility and empathy. Cisco has an imaginative, well crafted plan and a talent pipeline that is strong in many areas, and Chuck Robbins as CEO can effectively ‘ leverage ‘ these internal advantages. He may also take less time to get up to speed to the challenging tasks ahead. Cisco’s strong resources and loyal customers also can make his task relatively easier. Leadership change has all the positive ingredients of a smooth transition and performance after the change will only mark the grade. 2. Technologically speaking : Most analysts see R&D and Marketing in ACI ( Application Centered Infrastructure ) and SDN ( Software Defined Networking ) technologies as the decisive, transitional, and turning point in Cisco’s growth now. Last July, Cisco introduced the ACI product line of Switches & Software. It competes with SDN technology for VMware and smaller players like Switch Networks and Cumulus Networks. SDN, Open Source Technology, and White Box Switching are the three key aspects likely to lead the way for disruptive transitions in the ‘ Networking Industry’ in future. To put this in clear perspective : (a) Enterprises need a new approach to network their expenditure and that may be fulfilled with SDN; (b) Open Source Technology is a wholly new approach to development that promises faster development, better customization, and improved functionality; and (c) White Box Ethernet Switches offer IT the advantages of flexibility, lower Capex, and potential of lower operating costs as compared to traditional ‘ Black Box ‘ Ethernet Switches. Dell, HP, and Juniper are also entering White Box economies. These could well contribute in a significant manner to the changes from Cisco in future. Analysts also cite Analytics, Computing Power, and Software for the IoT continuing with an accelerated pace. Chuck Robbins speaking to a group. Final Word : Cisco Live, the grand Customer Event, to take place in San Deigo in June 2015 – a month before the leadership change – where CIOs, Network architects, and rank & file admins from thousands of Cisco’s customers will be at the show. This will probably where one can get more information on their future strategies and listen to the speeches of the leaders while the baton is being passed.